According to the Twitter account @leaksfly, Qualcomm’s processor roadmap has been leaked, and now we have info for the company’s upcoming silicon. In total, there are five chips, but two – the Snapdragon 625 and 629 – feature what appear to be the exact same specs. From the document, we have the Snapdragon 616, Snapdragon 620, Snapdragon 625, Snapdragon 629, Snapdragon 815, and Snapdragon 820. Most exciting is the Snapdragon 820, which you can imagine should be quite the little powerhouse. 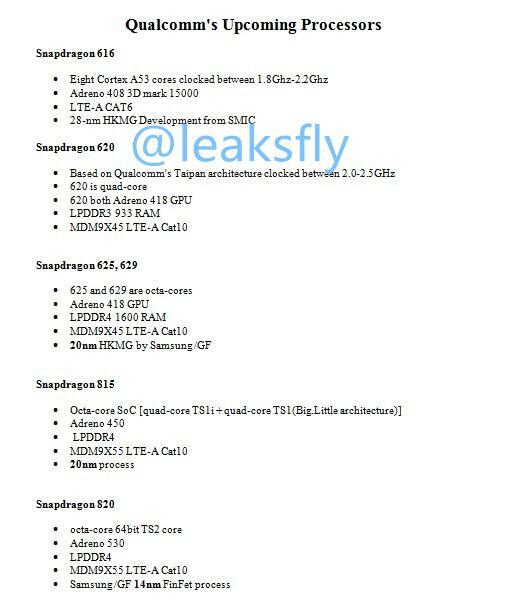 From what is stated on the leaked document, the Snapdragon 820 is a 64-bit octa-core chip, featuring an Adreno 530 GPU. In addition, it features support for LPDDR4 RAM, LTE-Advanced connectivity, and comes in a very small size. For reported detailed information on the other chipsets, see the document down below. Naturally there is no mention of a timeframe for these processors, but at least we now have something to look forward to from Qualcomm’s camp. Do you think these chips be good enough to power next-gen devices?